After checking in at Pirate Fitness you can buy a set of flashing rave glow sticks, these are reusable - so much more environmentally friendly than the single use ones. We darken the room, get the disco lights going and start with a simple warm up routine. Then we work up a sweat dancing to floorfillers from 90′s rave to recent dance anthems. The routines are easy-to-follow and always have high or low impact options. It's all about fun, not about perfection. Take it to your level, keep it simple and enjoy the music. 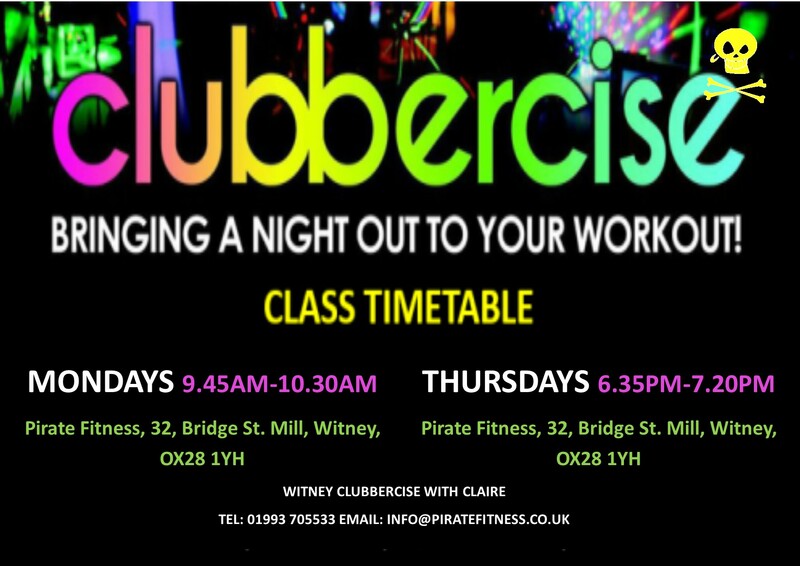 Pirate Fitness offers a dedicated fitness studio for its Clubbercise Witney classes with air-conditioning, disco lighting and awesome music and sound system. Even the floor is springy to protect your joints as you dance away! Our exclusive instructor, Claire, has years of experience as an instructor and raver!! Definitely not! We deliberately make our routines easy-to-follow so you can relax and enjoy it rather than worrying about getting the steps wrong. Currently just £5 a class. No heels - LOL! Just trainers/sneakers and sportswear/fitness clothing… Neon is optional! And make sure you bring some water.